Bolivia's Ambassador to Seoul Guadalupe Palomeque de Taboada (2nd from left) poses with President Cho Dong-Joo (left) of the Bolivia Chapter of the International Network for Korean Entrepreneurs (INKE), Minister Counsellor Luis Pablo Ossio (3rd from right) of the Boliivian Embassy, 1st Sec. 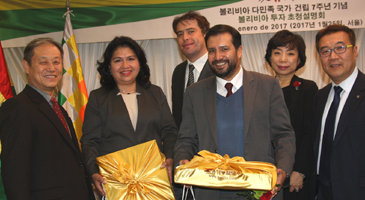 Juan Pedro Calderon Zabala, and with two other Korean guests at Hotel President. Bolivia's Ambassador to Seoul Guadalupe Palomeque de Taboada hosted "Bolivia Investment Promotion Event" at Hotel President in downtown Seoul on Jan. 25, 2017 on the occasion of the seventh anniversary of the foundation of the Plurinational State of Bolivia. Normally the national foundation day of the landlocked Latin American nation falls on the 22nd of January each year. The event was co-organized by President Cho Dong-Joo of the Bolivia Chapter of the International Network for Korean Entrepreneurs (INKE). President Cho is the Korea-born international business expert operating in the Latin American country for the last 40 years. Bolivia's Ambassador to Seoul Guadalupe Palomeque de Taboada (7th from right) poses with participants at "Bolivia Investment Promotion Event" held at Hotel President in downtown Seoul on Jan. 25, 2017. Scores of local Korean businessmen and women and the local journalists and other experts were invited to the business promotion networking dinner event held at 6 p.m. on the day. The Bolivian envoy made the presentation about her country regarding the benefits of starting business in Bolivia, followed by overall introduction of the nation by President Cho. Both President Cho and the Madam Ambassador emphasized the favorable business environment in Bolivia and procedural matters. They explained that Korean investors can enjoy the benefits in the South African country including stable legal framework supported by Bolivia’s legislation, which enables equal treatment for foreign enterprises legally established in Bolivia. The Bolivian envoy also showed the different landscapes; and in particular, some important historical legacies left by ancient civilizations such as Tiwanaku, Mollo, Moxos, and the Inca Empire. She explained on the main features of each of the nine departments of the country, by illustrating it with colorful pictures from the most popular sites. The traditional Korean dishes were served for the dinner following the presentations. A special Bolivia's spirit and wine were also served for the diners. The highly tasty Bolivia's wine "Tanat" earned an international award, according the envoy. "We would like you to feel the aroma of this altitude wine of Bolivia and imagine for a moment, being in our country, where you will be always welcome,” Madam Ambassador said while making a toast.